I grew up in Clearwater, Florida, just a stone’s throw from Walt Disney World. I have years and years of childhood memories of my time with the big Mouse and I get all nostalgic each time I have a chance to let my boys experience the magic. We’ve been really fortunate to have already visited twice with Oscar and one of those times, Calvin got to come along. I don’t know what it is about that place, but I want to make sure we get down there as often as we are able. One of my favorite times to visit was during Christmas. My family couldn’t always afford the parks, but Downtown Disney was always free. We would spend the day walking through the shops, taking photos and enjoying the beautiful decorations. There was always some kind of live music too. I have a smile on my face just thinking about it! Chances are, we won’t get to visit Disney too much over the holidays but this year I am really excited because Disney is coming to us! 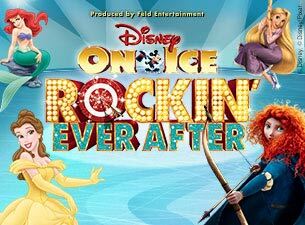 Next week, Disney on Ice comes to Raleigh with the Rockin Ever After show and we will be there on opening night! And while Princesses (like Ariel, Rapunzel, Belle, and Merida who is making her debut) will be the stars, I have no doubt that the boys will love it. Mickey and Minnie will also be there and I can’t wait to see Calvin’s face when he sees Mickey. Their relationship had a rocky start, but they are now the very best of friends. I didn’t expect to have a Disney holiday fix this year, but I think this show will be just what I needed. I mean, the kids. What the kids needed. Right. Disney’s Rockin’ Ever After will be at the PNC Arena from December 5-9, 2012. Check out Ticketmaster to find tickets. I hope to see you there! Will you be going to any live shows this year? Do you have any Holiday traditions from childhood that you want to pass on to your own kids? Disclosure: I was provided with tickets for this event, but I was not asked to write this post. I just love me some Disney! All opinions are my own. Great post. Looking forward to it. I know we will all have a grand time.